You definitely want to make sure that you select the correct contact settings for your LinkedIn profile. After all, if you’re looking for a new job, for example, you want to make sure the option for Career Opportunities has been checked. Go to LinkedIn and log in. Hover your mouse over the Account & Settings button (a small version of your picture) in the top right corner of the screen, then click the Review link next to Privacy & Settings. Your browser presents you with your Account Settings page. From the headers in the bottom left of your screen, click Communications. Then, in the middle of the screen, click the Select the Types of Messages You’re Willing to Receive link. This opens up a Types of Messages box. Select your option(s) under the Messages header for what types of messages you wish to accept. 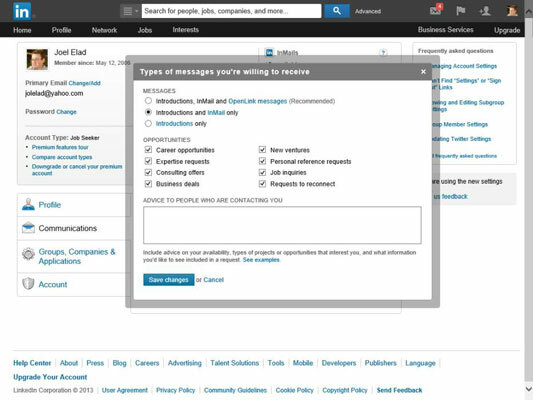 If you wish to receive mail through all of LinkedIn’s different communication systems, select the Introductions, InMail, and OpenLink Messages option, so that people can contact you through any of those three methods. If you only want to receive InMail e-mails from people who aren’t direct connections in your network, but not anyone who’s using LinkedIn’s OpenLink system, select the Introductions and InMail Only option. Select the correct options in the Opportunities section. The items you select here appear as a bulleted list in your profile and limit (or allow) the ways in which other LinkedIn members can contact you. If you don’t want to receive any InMail or introductions from other LinkedIn users, you can deselect those check boxes, and no options to contact you are displayed on your profile. To give advice on how people can contact you, fill in that information in the indicated text box. For example, if you require a few pieces of information from someone before you add him to your network, you can indicate that in this text box. You can also indicate whether this is a good time to contact you, or what projects or subject areas you’re involved in. You’re taken back to your Account settings page.